When I looked up at the main slope, I was speechless, then the words came—steep, moguls, trees. Wow. At 12,000 ft, Taos’ Mt. Kachina is close to the top of the World. 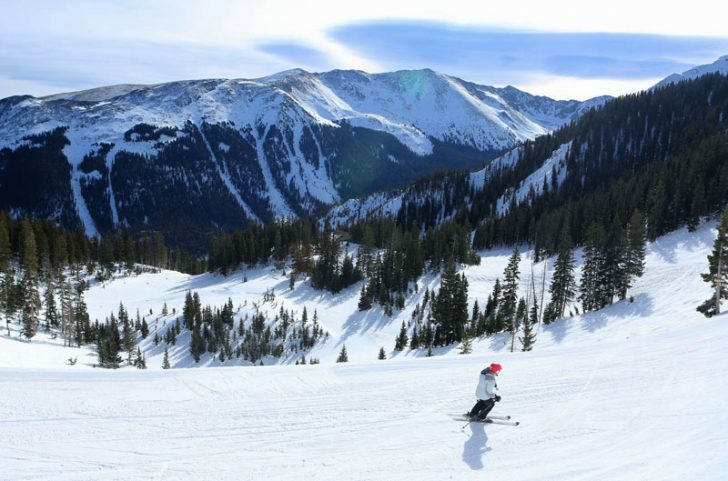 The resort is located in northern New Mexico, which one seasoned skier described as “a mix of a desert and mountains, unusual and beautiful.” The Blake family discovered, founded, developed, and an Taos Ski Resort since the mid fifties. In 2013, new management built new lifts, hotels, and other facilities. The result is a cute, small, Euro-style village with an obvious French-Swiss touch and a huge mountain with well groomed slopes, moguls, cornices, glades, and trees almost up to the very top. Snow is quite dry there because of the altitude. Taos is a breathtaking resort in more ways than one; the town is the highest municipality in the US. Note single chair on left. Credit: Val E.
Kachina Peak is the highest peak reachable by a triple chair in the North American Continent. Resort lodging options include hotels, condominiums, and bed and breakfasts. The new jewel of Taos is the luxury Hotel Blake, named for the resort founders. The interior is elegant, the restaurant is high-end, and the rental area looks like a high tech lab. The Ernie Blake Snowsports School is one of the highest rated ski schools in North America. Ski instructing services for groups, especially for ski clubs, were quite reasonably priced. One of the best parts, besides the slopes and snow, is super friendly employees. Ski lift operators and ski patrol people were waving and smiling like old friends. One ski resort host kindly ride with me just to introduce to the mountain. During my week stay at the resort, I talked to a few local skiers, some of them were from the 50+ category. 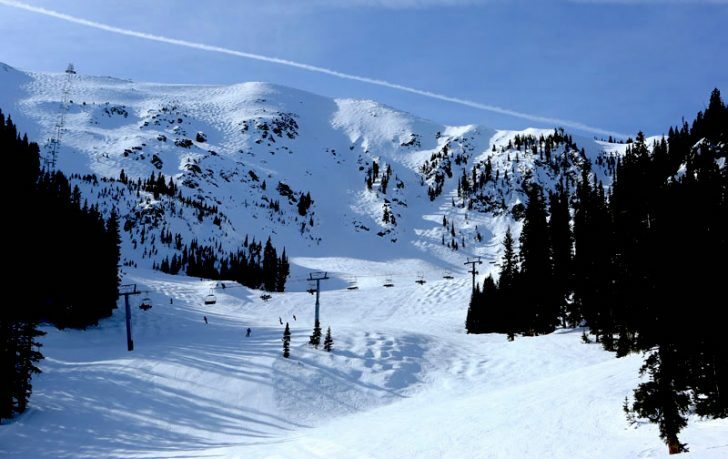 Taos Ski Valley is a rugged mountain, pioneered by people who put skiing first and all else second. 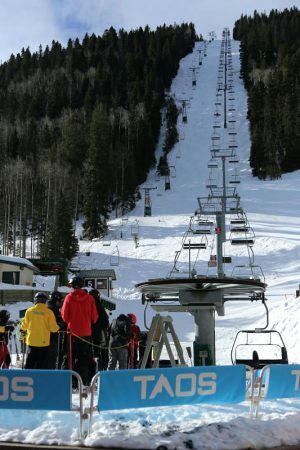 If Virginia is for lovers, then Taos is for skiers! 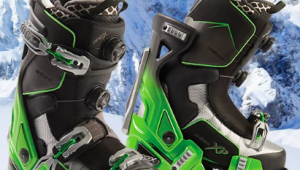 110 trails 55 for beginner/intermediate and 55 for advanced/expert skiers. Trees up to the top are a trademark of Taos. Credit: Val E.
Val E. has an interesting background in the ski industry. Val used to work as a ski slalom course supervisor, snowboard technician, ski/snowboard clothing consultant, ski engineer, ski/snowboard writer and photographer in the U.S. and in Europe. He traveled to 25 countries, found snow in 11 of them, and he is still searching. Val currently lives in Washington DC Metropolitan Area. Just a warning to flat landers visiting Taos. If you fly in there is a good chance you will end up with elevation sickness particularly if you stay at the mountain base (about 9000 feet). If you drive and give yourself enough time to acclimate (or live there) there should be no issues. I came to NM as an 18 yr old college student. i skied Taos for the next 25 yrs virtually every weekend. My most important ski memories were there. Skiing here is a sport, not a service. 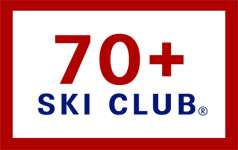 It’s one of the best areas on the planet for competent, confident skiers, period…The culture, the food, green chile beer, oh yeah….I’m 65 yrs ols now with 7 combined knee operations..( no more bumps).havn’t skied there for a number of seasons; somehow, not being able to ski the hight T, etc anymore, makes my memories as a current and future cruiser all the better. God bless Taos, if you’re a “skier” it’s a must..